As someone who treasures her 20-year-old “Waiting for Guffman” plastic lunch box, I have been eagerly awaiting the arrival of Netflix’s “Mascots.” The fifth of filmmaker Christopher Guest’s string of comical faux documentaries (not counting the heavy-metal spoof "This is Spinal Tap,” which he starred in and co-wrote with Rob Reiner directing) that examine insular communities whose members share an obsession—including dog-show competitors (“Best in Show”), ‘60s folk artists (“The Mighty Wind”), unlikely Oscar hopefuls (“For Your Consideration”)—is his first in a decade. That Guest uses the occasion to briefly revive his portrayal of “Waiting for Guffman’s” fabulously flamboyant Corky St. Clair, the Broadway wannabe who ruled a small-town theater troupe like a cross between Bob Fosse and Dame Edna, should be reason enough to toss confetti. The wacky world of sports mascots vying for the Golden Fluffy in Anaheim, Calif., at least sounds as if it should fit right into Guest’s formulaic sweet spot. As usual, the hit-or-miss ratio of the humorous repartee relies greatly upon the improvising skills of the cast and the spontaneous off-kilter references that result. Those that pop up here include a religious cult based on Michael Landon’s ‘80s TV series “Highway to Heaven,” the existence of a Rhea Perlman Middle School and, for fans of “The Alamo,” a chain hotel that offers both a plush “John Wayne Suite" and a downgraded “Slim Pickens” room. And no such effort would be complete without yet another cheerily clueless and horrifying politically incorrect Fred Willard performance, this time as a mascot coach who insultingly interrogates a little person (Brad Williams) about how he got small enough to fit into his worm get-up. He patiently breaks it to him that he was born this way. But as we are introduced to the main contestants and learn their back stories as a build-up to the main competition, the stale scent of been-there, mocked-that begins to permeate. Matters start off well enough as we are first introduced to two new recruits to Guest’s acting company: Zach Woods, whose eyes look like two nervous fried eggs that are about to burst, and Sarah Brown as Mindy, a tightly wound bundle of spousal passive aggression. They can run in their turtle and octopus guises as baseball mascots, but they can’t hide from the hostile undercurrents in their relationship as they talk directly to the camera. “Mascotting is not unlike a marriage,” Mike observes. “It’s about cooperation, it’s about listening, even if people are screaming at you, you’re not allowed to talk. And that’s a good lesson for a marriage.” Right after this statement, we hear him nervously ask the doctor treating his sore knee if he can prescribe anti-depressants. Too often what should be humorous instead comes off as disturbing psycho drama, deflating potential belly laughs to mere chuckles. Most of the foam-headed characters engaging in this blend of cheerleading and cosplay are varying degrees of damaged goods. They need the validation of a trophy and they need it desperately. 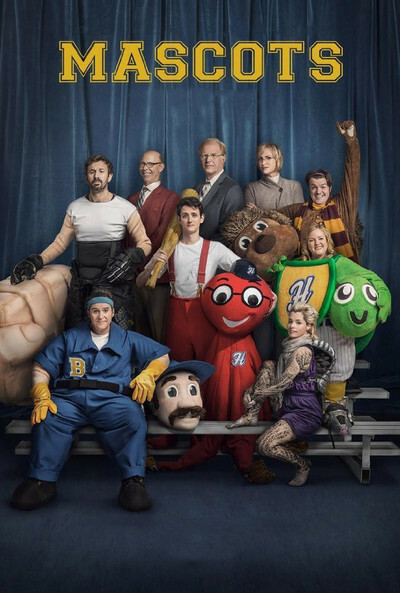 Among those we get to know are Chris O’Dowd, who starred in Guest’s HBO show “Family Tree,” as the self-proclaimed bad boy of mascotery whose brawling hockey-skater alter ego is a gigantic fist that comes off like an unleashed Id on steroids; Tom Bennett (also a “Family Tree” alum) as Sid the Hedgehog, a sweet British lad who inherited the gig from his imposing dad (Jim Piddock, Guest’s co-writer) who forbids any detours from tradition; Guest regular Parker Posey as a fading Blanche DuBois type behind Alvin the Armadillo, who does modern dance moves and dons aviatrix headgear while representing a school named after Amelia Earhart; and Christopher Moynihan’s Mario Bros.-like Jack the Plumber, most notable for injecting bathroom gags into the proceedings. Other returnees to the fold are the always-welcome Jane Lynch as a haughtily entitled judge whose claim to fame as the retired Minnie the Moose was doing a split for an entire extra-inning baseball game. She has since found religion, as recounted in her memoir “A-Moosing Grace.” Her bitter rival is a grousing Ed Begley Jr. as the onetime Danny the Donkey, whose groundbreaking anatomically correct costume was compensation for his own less-than-manly attributes. But more disappointing are Jennifer Coolidge doing yet another variation on a trophy-wife floozy and Bob Balaban as her sugar daddy. I don’t know if Guest should be applauded for addressing the issue of offensive sports team names and touching upon the subculture of Furries— those who don plush animal costumes, often for sexual pleasure—since these subjects don’t add much to the story. As the pre-contest antics grew tiresome, I kept anticipating what is often the most entertaining part of these pseudo docs: Seeing the cast actually perform in an amateurish stage musical, leading prancing purebred dogs around an arena, singing and playing instruments, or appearing in an unlikely movie called “Home for Purim.” But this time, given the difficulty involved in many of the routines, costumed stunt doubles fill in instead. Such masked anonymity simply kills the thrill of the final outcome. Missing in action are two masters at bringing such improvised oddball creations to life while investing them with enough emotional depth so that we can care and root for them: Eugene Levy and Catherine O’Hara, who are the king and queen of this peculiar comedy genre. In fact, O’Hara was just about the only reason to applaud “For Your Consideration.” Her portrayal of a veteran of B-grade movies who suddenly finds herself an inexplicable recipient of Oscar buzz, was as heartfelt as it was hilarious—and she even managed to give herself a bad face lift by simply by shifting her own facial muscles.